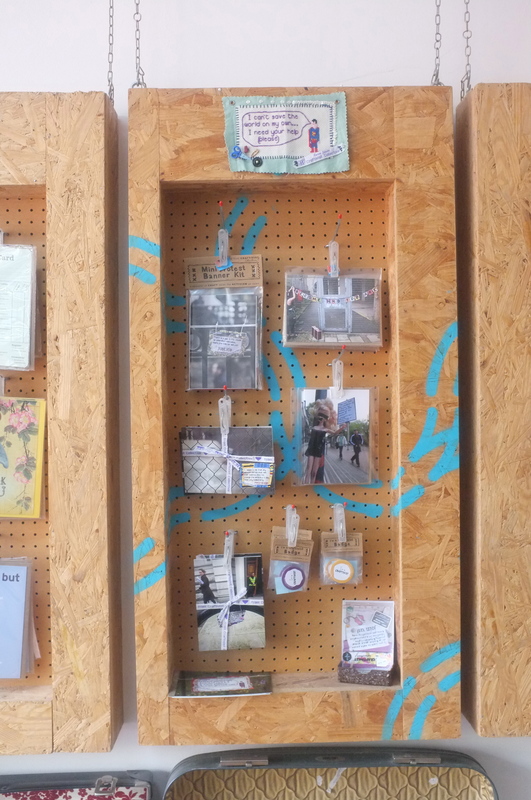 We recently delivered a Mini Protest Banner workshop at Fabrications craft shop in Hackney London and loved the new workshop space, ethos of the shop and the owner! 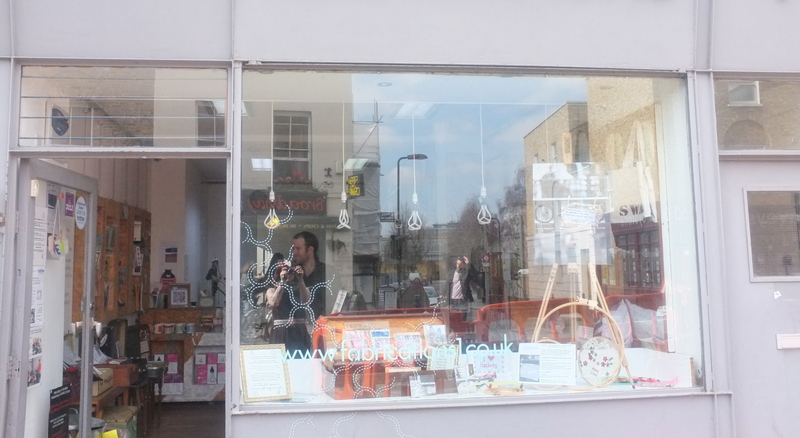 So much so we are going to work together again in June and September to deliver 2 more craftivism workshops (find them on the events page here) in this beautiful space.Fabrications are also selling our products in the shop and often have crafivism themed window displays before our workshops and events. 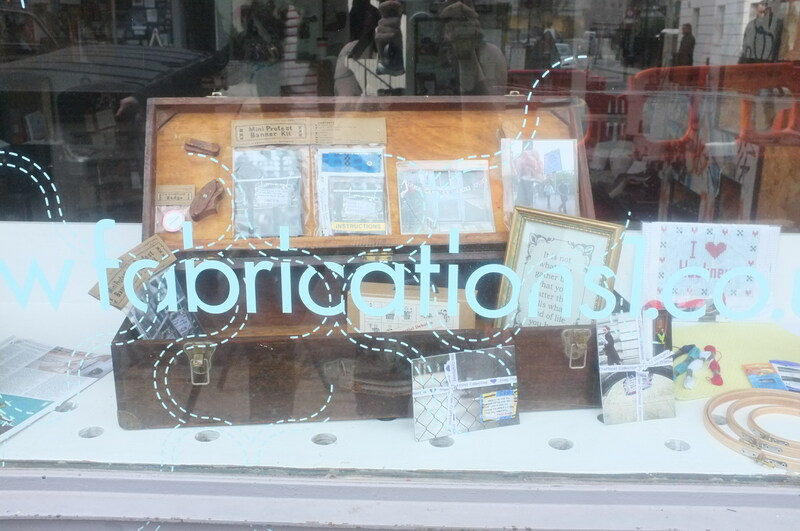 Fabrications is an independent gallery, shop and studio dedicated to contemporary textile practise and design, with a particular interest in upcycling and eco design. Fabrications was established in 2000 in a disused shop on Broadway Market, Hackney, East London by designer maker Barley Massey. 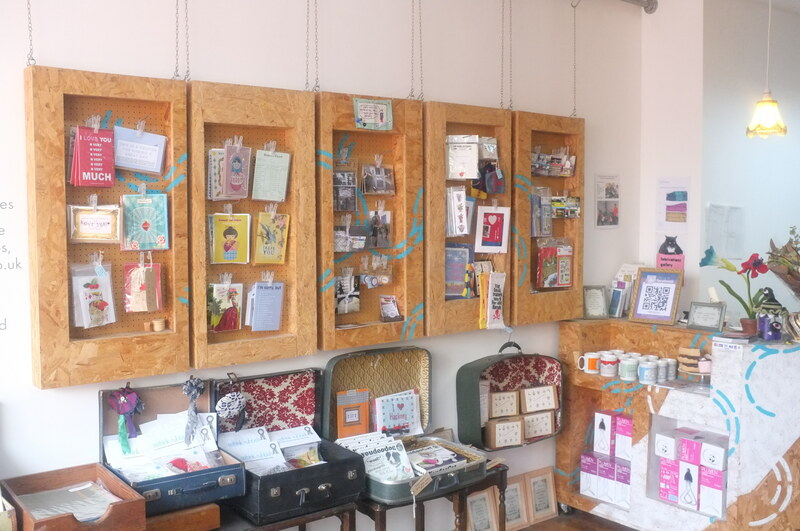 Over the last 12 years Fabrications has evolved into a buzzing little hub of creativity offering locally sourced handmade goods, gifts, knitting + sewing supplies and equipment. A commissioning service and a professional range of craft classes and events are also available. From the beginning Fabrications has strived to offer eco – excellence, strong ethical standards and build community in all that we do. The owner Barley Massey is an inspiring lady who quietly does exactly what Ghandi encouraged: ‘Be the change you wish to see in the world’. Barley is a textile designer maker who graduated from Goldsmith’s in the mid 90’s. Her practise has focused on upcycling local business and textile waste streams into functional and beautiful interior products. She is also passionate about passing on her skills, experiences and environmental and social concerns through creative workshops and events. As well as running Fabrications, Barley has worked with Amnesty International, Liberty and last year created the grass roots ‘Upcycling Academy’ at the Knitting + Stitching shows. We feel very privileged to have our workshops in such a beautiful building and business that really does make a huge positive difference in the local area and beyond. The beautiful modern design by Delvendahl + Martin architects has already been short listed for the NLA’s ‘Don’t move, Improve!’ award in conjunction with RIBA and Elle Decoration. In the spirit of Fabrications creator Barley Massey’s upcycling approach, the design incorporates building materials and components that are either reclaimed, recycled or made with low embodied energy. An example of this was the involvement of ‘Out of the Dark’ to design and install some of the furniture (the aim of Out of the Dark is to create a supportive environment where young people learn the ethics of work in a creative and expressive fashion). . After running a range of craft classes in textile techniques at the shop for 7 years, the new workspace will allow Fabrications to offer a wider range of skills, work with community groups, host craft parties and events whilst the shop stays open. New classes on the horizon will be creative upcycling with Barley, garment making with Hackney’s Rosie Martin author of ‘DIY Couture’, Laura Lee’s ‘The Mighty Stitch’ and thought provoking Craftivism workshops with Sarah Corbett, founder of the Craftivist Collective. 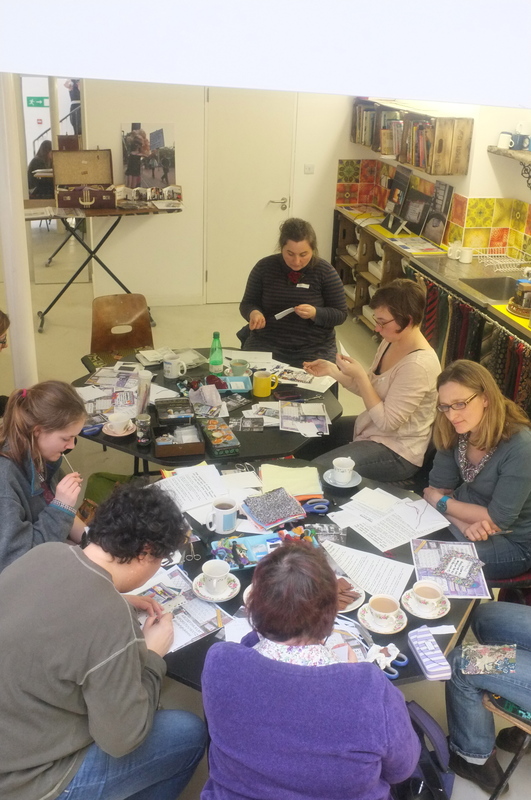 We hope people will come to our craftivism workshops and feel part of a wider craft community with a conscience. If you can’t attend please to share Fabrications and Barley’s stories and passions with your friends as an example of the beauty you can bring into the world.